Willie Nininger, is a singer, songwriter and guitar player, with origins in New York. Coming from the US, surrounded by a musical family - his father was a doctor but also a violinist - Nininger started his musical career in Switzerland in the early Eighties, playing for the luxury Hotel Jungfrau Victoria in Interlaken, then performing at all the 'in' places, especially in the Berner Oberland, but also elsewhere in Switzerland. In 1993 he won 1st prize at the Swiss Music Awards in Zurich. After a short time he got massively popular within his fan audience, and he lived for years on the relatively isolated Brunig Passin the Swiss Alps. Nowadays Nininger looks back on a great career as a guitar player and songwriter. He is still active in Switzerland and toured here in September 2014. In the interview with Christian Dueblin, Willie Nininger, a musician with a literature degree in his pocket, talks about his music career, his love and appreciation for Bob Dylan, and his other musical influences. He offers us the insider view of a talented and also intellectual musician who has played at some of the best clubs all over the world. If you want to know more about Willie Nininger's acquaintance with ex Swiss Federal Councilor Adolf Ogi, an event he used to talk about with a twinkle in his eyes while playing at a private concert above the lake of Brienz, you're herewith invited to read an intriguing interview with a great musician, who also knows how to rock out with Swiss Federal Councilors. 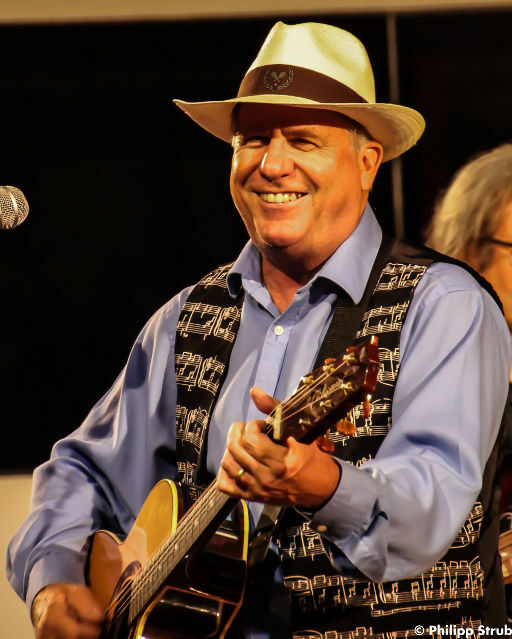 Christian Dueblin: Dear Mr. Nininger, you're a guitar player, singer and composer specialized in many musical genres - folk, rock and country music - and you're looking back at a great career as a professional entertainer playing in clubs all over the world. What brought you to Switzerland in the early Eighties? Willie Nininger: In 1983 I was living in New York City. I had written 5 songs for a national children's television program, and was playing at many different places with my brother Jim, my sister Ann, and my father Eugene who was a doctor, but also played the violin. One of these places was the Lone Star Café, where we met and performed with many famous folk and country musical artists, including Ernest Tubb, The Flying Burrito Brothers, Richie Havens, James Taylor, Levon Helm and Carl Perkins. One day we heard that a Swiss hotel owner was in town and looking for male-female duos to play in a new "Western Saloon" that had just opened in the basement of the Hotel Victoria Jungfrau in Interlaken. My sister and I went to an audition, sang 3 songs, and before too long we were flying to Switzerland to begin a 5 week engagement in Berner Oberland. Within a year, we were playing with a full band at the 1st Frutigen Singer-Songwriter Festival. You have lived for many years in an apartment on the Brunig Pass. Why did you choose that relatively isolated place in the Swiss Alps coming as you did from New York City? Along the same lines, why have you spent so many years in the Berner Oberland, where almost everybody interested in music knows you? By the 1990's, I was spending more and more time touring in Switzerland, but I still didn't have a steady place to live. When I played as a trio with 2 other American musicians at the Restaurant Kulm in Brunig for 10 days, Roland Schweizer, the manager there, let me stay in a large roof-top studio in the personnel house. When our gig was finished, I was not looking forward to packing up all my belongings and putting them into the car again so I asked Mr. Schweizer if I could stay and he said: "Why not?" At first it was a little strange, but soon I began to appreciate the beauty of the local area and its convenient location for travelling to different parts of the country. When I told the Swiss people where I was living, many thought I was joking and they asked: "Why would you want to live in Brunig?" I replied: "Because they need people there." I remember the nice feeling of returning there many times after driving lots of kilometers and playing many shows over several days. It was also a great environment for working on my music. Can you tell me if there's a difference in perception of your music between the audiences you've played for in New York and Berner Oberland? Every audience is different, regardless of what country you are in, and it's not always easy to see from the stage how your music is being perceived. 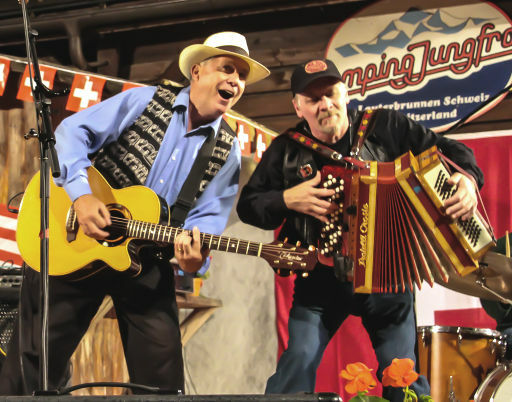 I remember one night a long time ago at the Western Saloon in Interlaken when a man watched all four of our shows and didn't applaud once (!). I couldn't understand why he would stay so long if he didn't seem to be enjoying himself. At the end of the evening, he came up to the stage and said: "I just want to thank you, that's some of the best music I've ever heard." So I always try to remember that story when I feel a show is not going well. The main difference I've learned between performing for Swiss and American audiences is that in Switzerland, for the most part, the people listening to you do not speak English as their first language. Therefore when I'm onstage in Switzerland, I always try to talk a little more slowly (in English) and also make an effort to try to speak at least a little German or French. Even though my accent is obvious and my vocabulary is limited, I've found that audiences really appreciate it when you make an effort to speak their native language. I've also learned that when I'm playing for people who don't seem to understand a lot of English, it's helpful to choose songs that are easy to sing along with, songs that have simple phrases like "Be Bop a Lula", "Lie, Le Lie" or "Go, Johnny Go". And of course, it's always a good idea in Switzerland to sing "Country Roads". I learned it when I came to Switzerland the first time because so many people asked for it, and it is still the most requested song at my shows today. I think I've sung it almost as many times as John Denver! You are an admirer of Bob Dylan and you've won prices interpreting his songs. What is it you like personally about Dylan and his music? Is this admiration only about his music, or is it also the literary factor in your life that plays an important role, since his lyrics are considered great contemporary poetry by many? When I was living in New York City, there was a club in Greenwich Village called the Speakeasy that held a Bob Dylan Imitator's contest every year. I won 1st prize once by singing the words to a Suzanne Vega song in Dylan's "Nashville Skyline" voice to the tune of "Lay Lady Lay". Bob Dylan has had a very big influence on me as a songwriter, especially when I was starting out. I remember when I first got one of his records for Christmas. How I listened to it over and over, because it was so different from what I had heard before. I spent a lot of time studying and memorizing his lyrics. I still perform several of his songs in my repertoire. I like a lot of his work, but if If I had to pick one, I would probably choose "Like a Rolling Stone". Of course, I have had many other influences as well. Hank Williams, Gordon Lightfoot, Joni Mitchell, James Taylor, Sheryl Crow, Leonard Cohen, John Lennon, Paul McCartney, Pete Seeger, Bruce Springsteen, Jackson Browne, John Prine, Loudon Wainwright, and Steve Earle are all favorites of mine, and if I spent some more time, I'm sure I could think of many more. One of the great things about when I was younger and hanging in Greenwich Village was that there were so many songwriters around. We hung out at the same clubs, watched each other perform and spent many late nights together passing the guitar around, playing our latest compositions. When you are beginning to write you are influenced by many different artists and you learn something different from all of them. Eventually, hopefully, this all blends together and you develop your own style. While I was listening to one of your concerts at a private party (at Rosemarie's and Eckhart's place with the striking view of Lake Brienz) you told me of your encounter with former Swiss Minister Adolf Ogi, who started to sing with you in Kandersteg after winning the election in 1993. Ogi has since become one of the most well known Swiss citizens on the planet. Would you care to tell us more about his unquestionable musical skills, and the Ogi blues? I met Adolf Ogi by chance. On the night of his election celebration (1993), I was booked to play downstairs in the Kandersteg Town Hall. When we arrived, I was surprised to see about 400 people packed into the room and asked why it was so crowded. I was told that the new President of the Confederation was a native of Kandersteg, so most of the town had shown up to honour him. There was folk music upstairs and we were downstairs. I didn't see him anywhere so I said, "Where is he?" I was told he was at the 5 star hotel in town, and that he would come to see us later. He finally showed up about 11:30PM, and everyone cheered loudly when he walked in the room. It was a great, happy scene. As he came up to the stage and shook my hand, I asked him if he wanted to sing with us. He was in a very good mood, so he said "Yes!" We had no idea what to play, so we just started playing a blues rhythm. Pretty soon, everyone was clapping along and we were all chanting "Ogi, Ogi, Ogi!" This went on for a LONG time. Everybody was singing and dancing and generally having a good time. It was a great party. My manager at the time was a friend of mine from Boenigen named Christian Riesen. The next day he told me: "That was great last night, you have to put the Ogi song on your new record". I said: "I don't think we can do that because the record is pretty much finished and anyway, it's not really a song, it's just something we improvised while we were onstage." He said, "None of that matters. Ogi will be the President of the Swiss Confederation for only one year, and you have big opportunity here, so you have to finish the song now and add it to the record." The next day, my bass player from Virginia, Danny Counts, helped me write some lyrics (he came up with the great idea of rhyming "Wanderweg" with "Kandersteg"), and in a couple of days, we were back in the studio to record the "Ogi Blues". Paul MacBonvin came from Valais to play the electric guitar, and we finished the song in one afternoon. As soon as we released the record, we sent a copy to Mr. Ogi and he sent a very nice letter back to us, saying that he enjoyed singing with us and that he really liked the song. We got a LOT of publicity from that (especially in Berner Oberland), and a couple times after that, when we were performing in Klosters and Zurich, he came onstage again and sang the song with us. Ogi, Ogi Ogi! You've just ended a successful tour in Switzerland. What are your upcoming musical plans, and when can we hear you again in our country? My upcoming musical plans for the near future are mostly centered around performing throughout the north-eastern United States (I live in Connecticut), but I will definitely be returning to Switzerland next year because I am booked to play with a 5 piece band at the Country Festival in Reichenbach on May 9th, 2015. When I lived in Switzerland, it was easier to arrange shows because I was in the country already! Now, I have to pick a period of time and try and plan as many shows as possible within that limited time frame. So now I'm looking at the end of April and the first two weekends in May. Luckily, a lot of the musicians in Switzerland I used to perform with are still around. Karl Guntern (from Stechelberg) started playing bass with me in 1993, and has been an invaluable friend and asset to my career in many ways since then. He has literally learned hundreds of songs that I do and seems to be able to remember how to play them even if we haven't performed them for a long time. He also was my manager for many years, and still helps with booking concerts, organizing music equipment, making travel arrangements, and many other things. My friend Andre Gigon, who lives in Canton Vaud has been a similar help to me for many years, booking many shows in the French-speaking area of Switzerland. Aschi Maurer from Frutigen and Marcel Bach from Gstaad have also been helpful from time to time in booking larger venues. I feel very grateful for the music career I've had in Switzerland. I've played from Zurich to Zermatt, stayed in many wonderful hotels, seen some beautiful scenery, and met a lot of great people. I'm very thankful that I still have the opportunity to come to Switzerland and continue the journey I started a long time ago. (C) 2014 by Christian Düblin. All rights reserved. Other publications require the author's explicit consent.